The bride and groom with take the cake with the kate spade new york Take the Cake Toasting Flute Pair. 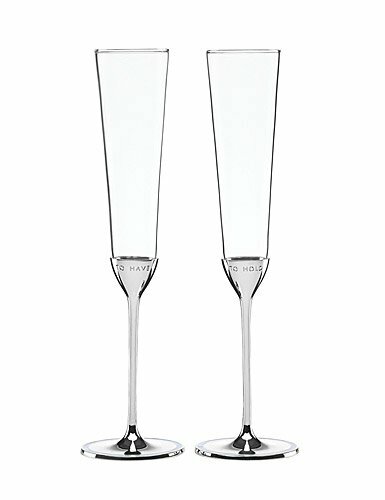 Crafted with silver-plated stems and glass bowls, these kate spade toasting flutes will celebrate the newlyweds in a very lovely way. One Take the Cake flute is inscribed with the phrase "To Have" and the other with "To Hold". Crafted of silver-plated metal and glass by Lenox under license by kate spade new york, which has reviewed this product for quality and authenticity. These kate spade wedding flutes are sold in pairs and 10" tall. Hand wash.
One flute is inscribed with "To Have" and the other with "To Hold"